That shady link between Big Tobacco.. This represents a new narrative opening up. The story now is that Nicotine Replacement Therapies (NRT – gums, patches, etc.) are not very effective and this somehow the fault of the tobacco industry, rather than the pharmaceutical industry. Stanton Glantz – for it is he – jumped the shark a long time ago so I am reluctant to say that this is a turning point for him. Nevertheless, this is quite a pivot. Not only does he say that NRT doesn’t work, he says that it keeps people smoking. From the outset, IBVTA made it clear that we did not support the TPD, indeed many IBVTA members had spent a great deal of time and money fighting the TPD over a number of years. However, in April 2016, when IBVTA launched, the TPD was a reality. The challenge for us therefore was not fighting the TPD, but credibly influencing its implementation in the UK. At the end of July, the Food and Drug Administration (FDA) in the United States did something remarkable — even revolutionary. They decided to behave in a rational way about nicotine – embracing a sensible “harm reduction” approach. Canada would do well to follow. Instead, Canada has been focused on “risk aversion” where nicotine is concerned – and such a stance, ironically, protects the cigarette trade. The ‘Nicotine and Tobacco Research’ journal has carried a study by New Jersey and New York clinicians and academics, titled “Content analysis of U.S. news stories about e-cigarettes in 2015”. Vapers may have a good idea what they discovered, but documenting the facts may add weight to future debates. This is nothing more than a government introducing a legal protection racket in writing, no one else can do that. For the third time in recent months, a study shows clearly that vaping is helping smokers quit or stay off cigarettes. When will American public health officials and special interest groups like the American Cancer Society and the American Lung Association start to pay attention? 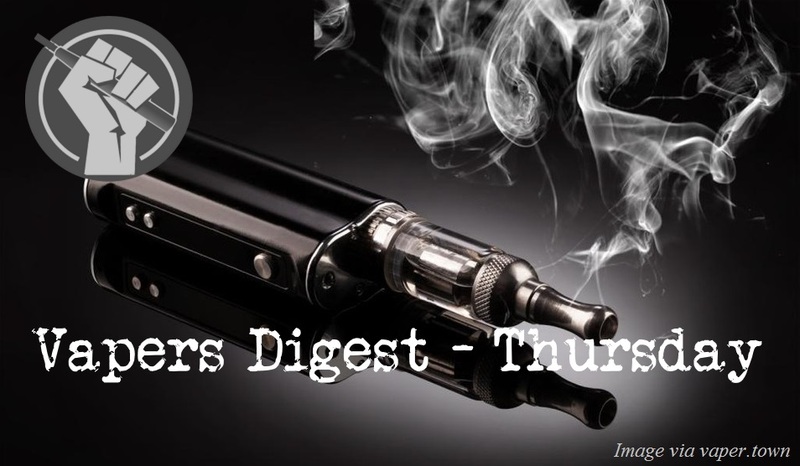 The new research shows that among established adult smokers in the last five years, daily vapers were more like to have quit smoking than those who never used vapes. Over the five year period studied, 52 percent of the daily vapers quit, versus just 28 percent of the non-vaping smokers. Have you noticed the exorbitant price of cigarettes recently? With cigarette prices increasing by 12.5% every year, the Federal Government has opened the floodgates for a black market on cheap tobacco. Brian Carlton talks with Tobacco Treatment Specialist and Associate Professor of Public Health and Community Medicine at the University of New South Wales, Colin Mendelsohn, about this new black market industry. A Facebook ban on advertising related to electronic cigarettes is undermining public health and blocking access to “life saving” information for smokers, according to medical experts. It comes as little surprise that Facebook bans advertising actively promoting tobacco brands or advocating the use of tobacco products, but that ban extends to vaporizers and e-cigarettes. Vaping devices heat liquid nicotine and do not contain tobacco, but are often labeled as tobacco products and included in any restrictions applied to traditional cigarettes. Philip Morris International wants to move smokers away from conventional cigarettes to a new product that’s heated rather than burned — but first it needs a green light from the government. It has petitioned the Food and Drug Administration (FDA) for approval to sell IQOS, which it calls a “less risky” smoke-free tobacco product, in the United States. Smoking and other tobacco use is not a disease, it is a consumption decision. So attempts to understand it through the lens of medicine, rather than that of welfare economics (the science of consumer preferences, choice, and welfare), create confusion, absurd claims, and bad public policy. Public Health staff have been working with two local organisations to support long term smokers to switch from smoking tobacco to e-cigarettes, reducing their risk of serious harm from smoking. Let me start with a misunderstanding. Professor Daube accuses me of a personal attack on Professor McKee. In fact, I madefive specific substantive comments on Professor McKee’s short letter, to which Professor Stimson added a further two. These are corrections of fact and understanding, not a ‘personal attack’. It is important that academics understand and recognise this distinction.